Design Rebel: Spring Has Sprung! Posted March 26, 2015 by eventreb & filed under Event Design, Event Rebels Blog, Green Meetings. It may still be 40 degrees outside, but Spring has officially arrived, and with Spring comes new event design trends that’ll be popping up just like that grass you’ve been patiently waiting for. If you think you can escape floral arrangements, you’re dead wrong. Floral arrangements can be very mundane, unoriginal and boring, but they also have the ability to transform into some pretty spectacular decor elements for your next event. 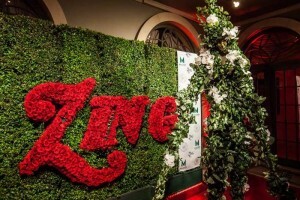 Flower walls are a very cool way to make your logo stand out. Companies, like Dior, are known for this type of branding. They create an interesting backdrop and a great photo opportunity. If you’re looking for exposure on social media and flower wall is a sure bet. One of the biggest complaints about floral decor is the smell. For guests with sensitive noses this can be a big deal. Take the odor element out of it by using paper flowers. With Spring arrives Earth Day (April 22, 2015), and the idea that once again people care about the environment, as they should. Using recycled materials (or materials that appear to be recycled), is a good way to win some bonus points from your attendees. Everything likes to think they are supporting good corporate social responsibility. One of the biggest trends in recycled materials for decor is reclaimed wood. 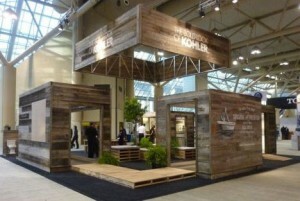 Kohler won the “highest award level for its sustainable booth design and construction” from the US Green Building Council back in 2011 for this reclaimed wood trade show booth. Attendees certainly took notice. When the weather is nice out and a new season begins, attendees expect new menus and fresh food. Farm to table is a common theme for those attendees who like fresh food and enjoy supporting the local economy. Farm to table can extend past seated meals as well. A new trend in session breaks at conferences is healthy snacks.Attendees are desiring healthier options than pastries in the morning. 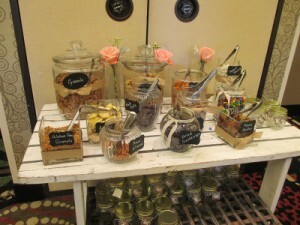 It’s not uncommon to see “build your own granola” stations and homemade snack bars made in house. It’s a great energy booster for midday, or add some yogurt on the table and start the day off great with parfaits!